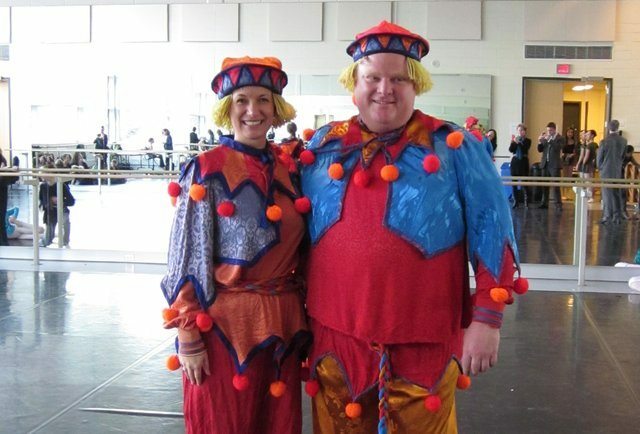 This past weekend, Mayor Rob Ford made his stage debut at the National Ballet of Canada. But we ask, is he playing nice so companies will play it safe? Rob Ford and his co-star, Councillor Michelle Berardinetti. A regular Baryshnikov! Photo courtesy of the National Ballet of Canada. What are the holidays if not for the traditions that go along with them? Not least among these: the National Ballet of Canada’s annual production of The Nutcracker—which has its own traditions as well, including rollerskating bears, dancing horses, and celebrity cameos in the roles of the two Cannon Dolls, appearing for about two and a half minutes during the Act I battle scene. This year, local journalists, musicians, sport figures, and TV personalities will festoon themselves in the bright clownish costumes throughout The Nutcracker‘s run, but all were overshadowed (and we mean that in a symbolic sense) by one guest in particular who appeared in the season’s opening performance Saturday afternoon: His Worship, Mayor Rob Ford. Since the first announcement of his dance debut, the jokes have been a little too easy: stuff about “being light on his feet,” “playing the clown,”—and the biggest knee-slapper of all: that he would make any kind of gesture that’s friendly towards the arts. Ford isn’t exactly an arts organization’s biggest ally, even an international force like the National Ballet of Canada. As he hopped around rambunctiously onstage according to James Kudelka’s choreography, eagerly urging Councillor Michelle Berardinetti at his side to fire the cannon and spew streamers towards the audience, his proposed 10 per cent budget cuts were taking similar aim at the NBC, which stands to lose $114,860 in funding from the City. But just like trips to the family cottage, we all know that Ford is a stickler for tradition. So while he tends to ignore other invitations to smaller, independent shows (of which there have been, and continue to be, quite a few including another holiday show that’s on right now), it is interesting that he has chosen to participate in The Nutcracker. Because while it is still a holiday favourite for little girls in puffy party dresses, their parents, and their grandparents, it is exactly what you would call “safe.” Audiences will always chuckle when the robotic rat flies across the floor, gasp when the tree magically grows, melt when tiny little lambs bounce in disorganized unison, and sigh when the Sugar Plum Fairy has her final pas de deux with The Nutcracker Prince. And they will definitely always shell out for a ticket. Karen Kain herself has said “If we do not make the revenue we need in Nutcracker, we’re really in big trouble and we can’t keep the company afloat.” While the NBC prefers to fill the rest of their season with alternative, challenging pieces, it relies on the annual holiday cash cow (a brutish term, really, for such a lovely show) in order to survive. But in the era of Rob Ford, where every dollar counts even more than before, the appeal to “play it safe” for the box office’s sake could be fatal to Toronto’s artistic edge. The idea of artistic risks versus conventional productions has arisen in the local theatre arts media as of late, with several articles coming down on the new direction of Canadian Stage under the helm of artistic director Matthew Jocelyn (who is on the verge of announcing the line-up for his third season with the company). While other outlets have piped up in support of Canadian Stage’s mostly-acclaimed 2011–2012 season, it’s now in a rather sticky position with its home, The St. Lawrence Centre for the Arts, up for sale by the City. Many have said that the size of the Bluma Appel Theatre just isn’t the right fit for the company anymore, now that they’ve switched their box-office friendly seasons of big-budget, post-Broadway names for more challenging, conceptual works. Soulpepper Theatre, known for remounting theatrical icons in a classical style, is also trying something new in 2012 by kicking off its season with Kim’s Convenience, the 2011 Toronto Fringe runaway hit that will be the company’s first original production. Though it might not draw in Soulpepper’s customary audiences, the season is also bolstered with other well-known names like The Crucible, Death of a Salesman, and A Christmas Carol—choices that could also fall under the realm of good, but also safe. Moves by both of these companies are examples of efforts to draw in new and younger audiences, efforts that are poorly timed with an administration like Ford’s. And even with the arts sector cheerleading for the new Culture Plan (drawn up by a committee co-chaired by Kain), it’s worth noting that it too advocates for large scale, international artistic events—not necessarily those that seek to push boundaries or experiment extensively. This may seem to be very Torontoist-y of us to take what might be a genuine gesture of goodwill towards a theatrical production on behalf of Ford and still find something to criticize, but if there was ever a point that an artist or arts supporter was content in saying “at least it’s something,” then we are in a very, very bad place.